The expression of both isoforms is regulated differently. 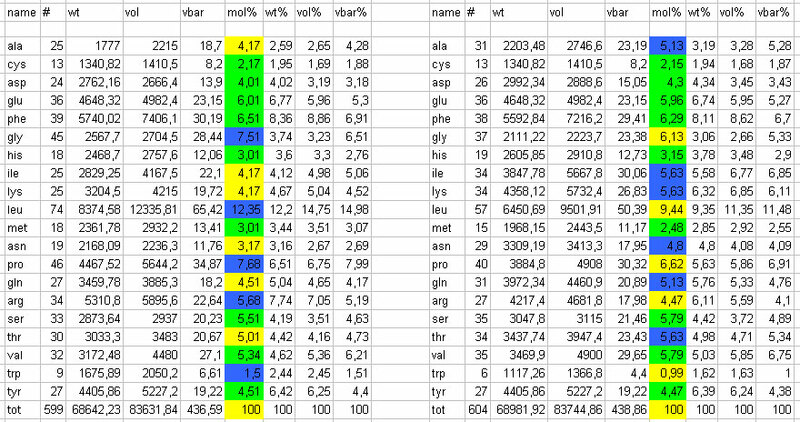 The COX1 gene is expressed constitutively in almost all cells. In fact, it is involved in immediate prostanoid biosynthesis and plays an important role in intercellular communication and modulation of local homeostatic functions. The inducible COX-2 is instead a result of pro-inflammatory stimuli and is involved in delayed synthesis of prostanoids. 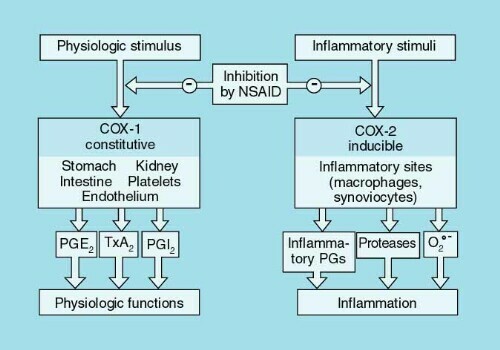 Pro-inflammatory stimuli such as IL1 and the endotoxin LPS can cause a rapid and intense induction of COX2 in various cell types such as macrophages, fibroblasts and endothelial cells of blood vessels. PTGS2 is associated with biologic events such as injury, inflammation, and proliferation. A major mechanism for the regulation of prostaglandin synthesis occurs at the level of cyclooxygenase, also known as prostaglandin-endoperoxide synthase (PTGS; EC 1.14.99.1). The first rate-limiting step in the conversion of arachidonic acid to prostaglandins is catalyzed by PTGS. Two isoforms of PTGS have been identified: PTGS1 (COX1; OMIM 176805 ) and a mitogen-inducible form, PTGS2 (OMIM 600262 ). The genes that codify for the two isoforms are located on different chromosomes. This localization clearly indicate that these genes are not genetically linked. In this link it is possible to compare the amino acids composition of the two isoforms. The major difference in the sequence of the two isoforms is in the regulatory region. Infact COX-1 is constitutively expressed in many tissues and cells and its gene does not possess a canonical TATA or CAAT box. These features are consistent with those of an hosuekeeping gene. Sp1 has been shown to contribute to constitutive expression of COX-1 and mutation in this regulatory sequence sgnificantly reduced to 40-50% that of wild-type. 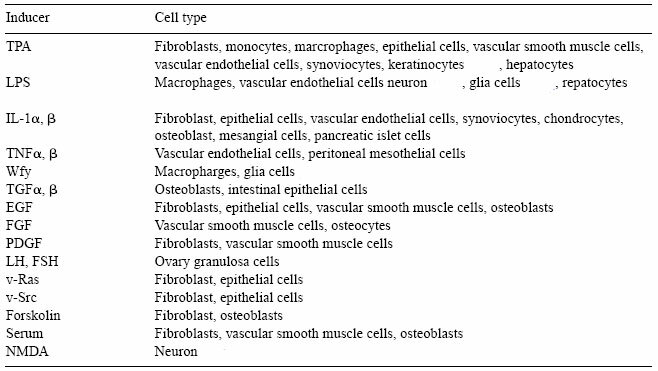 COX-1 is preferentially expressed at high levels in specific cells and tissues, including vascular endothelia, monocytes, platelets, renal collecting tubules, and seminal vesicles.